It was a scorcher of a day. 45 degrees Celsius, not a cloud in the sky, and I was off to visit one of the largest open-air archaeological museums in the world- Ancient Ephesus. The weather conditions weren’t ideal for visiting a place where shade was non-existent, but with only one day in port at Kusadasi, I had to just get out there and go for it! And wow, was I glad I did! 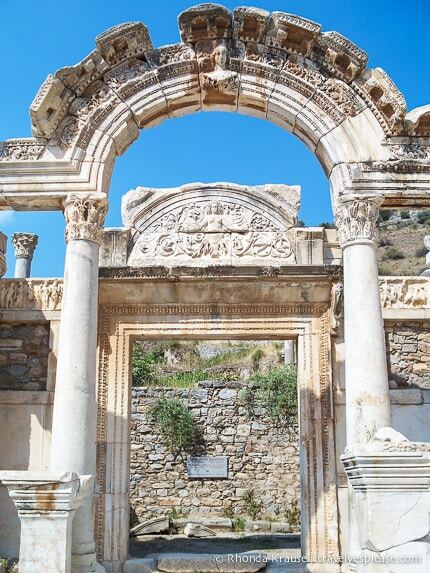 The ancient city of Ephesus is a must see for any trip to Turkey. Built in the the 10th century BC, Ephesus was one of the 12 cities of Ionia, an ancient Greek district on the west coast of Asia Minor. It was a large city (over 250,000 inhabitants in the first century BC) and a major port for trade routes into Asia Minor. Ephesus was known in antiquity for its sacred shrines, the most famous being the temple of Artemis, one of the Seven Wonders of the Ancient World (only foundations and sculptural fragments remain). Ephesus came under Roman control in 129 BC, and continued to prosper under Emperor Augustus as capital of the Roman province of Asia. Not only a significant city for the Greeks and Romans, Ephesus was also an important centre of early Christianity. Its greatest Christian monument was the 4th century church of St. John the Evangelist. Ephesus was one of the seven churches of Asia that are cited in the Book of Revelation. Excavations at Ephesus first began in 1863 and have successfully revealed much of the city. I loved being able to walk freely among the remains of temples, shops, houses, streets, churches and public buildings. You can see traces of the Hellenistic, Roman and Early Christian period scattered throughout the site. Ephesus is impressive because it contains the largest collection of Roman ruins in the eastern Mediterranean. I found the city to be very well preserved and reconstructed. The stunning architecture of the preserved edifices, statues, colonnades, even the Ancient Greek inscriptions, give a glimpse into the grandeur of Ancient Ephesus. Here are a few of the main sites that reflect the splendor of Ephesus’ former life. The Temple of Hadrian has been re-erected from surviving architectural fragments from the 4th century. It was dedicated to Emperor Hadrian, when he came to visit Ephesus from Athens in 128 A.D. The reliefs in the upper sections are casts- the originals are on exhibit in the Ephesus Archaeological Museum. The arch inside depicts a human figure, believed to be Medusa. She is surrounded by friezes that illustrate the foundation of the city- Androklos defeating the boar and Dionysus in procession with the Amazons. Originally built in 117 AD, the façade of the Library of Celsus has been carefully reconstructed from all original pieces. Gaius Julius Aquila built the library in honor of his father, Gaius Julius Celsus Polemaeanus, a governor of Roman Asia who is buried beneath the library. The library once held over 12,000 scrolls and was the third richest library in ancient times. Built in the Hellenistic Period (third century BC) during the reign of Lysimachos, the theatre was enlarged during Roman times to what is seen today. With a seating capacity of 25,000, it is the largest theatre in Anatolia, possibly even the largest outdoor theater in the ancient world. The theatre hosted plays, concerts, religious, political and philosophical discussions, as well as gladiator and animal fights. One of the main three streets in Ephesus, Curetes Street runs between the Library of Celsus and Hercules Gate. Along this street were shops, statues, fountains and homes of some rich Ephesians. Hercules gate is named so because of the relief of Hercules on it, depicted holding the skin of the Nemean lion. Only two columns remain of the original gate but it is believed that the flying Nike, found in the Domitian Square, was a part of it. The Odeon was a small, wooden roofed theatre that was used for concerts, plays and Senate meetings. Much smaller than the Ephesus’ other theatre, capacity of the Odeon was only 1,500 spectators. The Memmius Monument is located on the north side of Domitian Square. It was built by Memmius, the grandson of Dictator Sulla, during the reign of Augustus. On the blocks you can still see the figures of Memmius’ father and grandfather. This Roman Basilica is located on the northern part of the State Agora. It is 160 metres long and has three aisles and a nave. The basilica was used for stock exchange, commercial business and meetings of the Law Courts. The fountain was constructed by Sextilius Pollio, a rich Ephesian, in 97 A.D. Water was brought in from three main sources, travelling through aqueducts and distributed from the fountains by a branching system of baked clay pipes. The city did not charge for water from public fountains, which meant they were a great source of refreshment on hot summer days. Me in front of Domitian Square. The large arch on the left is Pollio Fountain and the two large columns on the right are part of Domitian Temple. Built around 104 AD, this fountain featured a statue of Trajan which stood on the facade overlooking the pool. The pool was 20 x 10 meters and was surrounded by columns and statues of Dionysus, Satyr, Aphrodite and the family of the Emperor. The statues are now in Ephesus Museum. Part of Scholastica Baths, these were the city’s public toilets. You had to pay an entrance fee to use them. The toilets line the walls around a pool in the centre of the room. There was a drainage system under the toilets. As you can see, there was definitely no privacy! Religious ceremonies, official receptions and banquets were held at the Prytaneion. In the middle of the ceremonial hall there was a small pit where a sacred flame was kept constantly alight, symbolizing the heart of Ephesus. I was thoroughly impressed with Ephesus and, as usual, wish I had more time to spend exploring. I am really surprised that Ephesus has not been named a World Heritage Site, but hope that one day UNESCO will add it to the list. (Update: Ephesus was inscribed as a World Heritage Site in 2015). Besides being incredibly restored, I loved the fact that the sights weren’t roped off, allowing me to walk freely around the city just as the Ephesians did centuries ago. 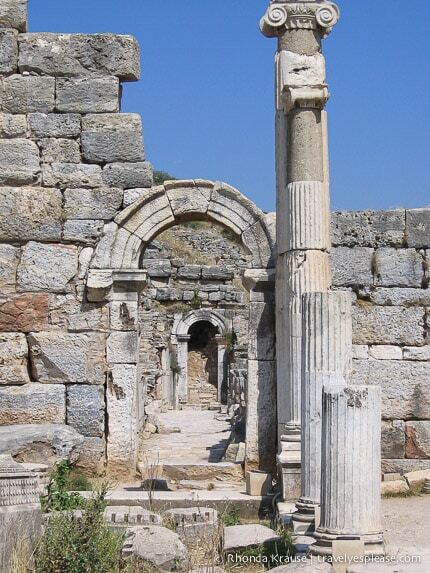 If your cruise ship docks in Kusadasi harbour or Izmir harbour you can easily visit Ephesus. It is about a 20 minute drive from Kusadsi and 1 hour 15 minutes from Izmir. Izmir has the nearest airport to Ephesus and is about a one hour flight from Istanbul. Keep in mind that it gets very hot and there is no shade at Ephesus. I used an umbrella for shelter from the sun. Consider hiring a local guide. Our guide was fantastic and it’s always more interesting to have someone tell you the stories about each site versus reading about it in a guide book. Here is a trusted site where you can book tours of Ephesus.